By tracking compliance & managing risks, complaints & incidents, Tickit On Demand frees your staff to do extraordinary things. Tickit On Demand is the ideal risk, compliance and incident management solution for Not for Profit organisations. Tickit On Demand is intuitive, easy to use and available at a fair price. Tickit On Demand is aligned with the ISO 31000 risk management standard, AS/NZS 4360 risk management standard and AS/NZS 3806 compliance standard. Tickit On Demand provides a structured framework for risk management, compliance management, incident management, complaint management, audit issue management and much more. Tickit On Demand means real savings in time and money for Not for Profit Organisations. Leading Not for Profits use Tickit On Demand to manage and track compliance, risks, incidents, complaints, audit findings and many other issues. These governance functions are typically managed on paper or using spread sheets making information management and report generation a time consuming and expensive process. Tickit On Demand consolidates information into one database, it is intuitive and easy to use and generates great reports that are valuable to Management and Board. Not for Profits are faced with a range of obligations related to legislation, funding agreements, accreditation and internal policies and procedures. The Board, CEO and Management need an effective system to ensure that these obligations are being met. Tickit On Demand provides the ideal solution. Obligations can be allocated as tasks to staff who can easily sign them off when due and even attach evidence or make comments. Reports can be generated that highlight information such as exceptions, overdue tasks, and progress notes. Incidents and complaints are reported all the time. They need to be managed immediately rather than put off for the next staff meeting. 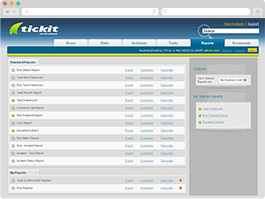 Tickit On Demand will allow you to publish incident, complaints or any other type of issue reporting form on your intranet. When an issue occurs users can simply click on the form and report the issue. Issues can then be tracked and managed in Tickit. They can even be linked back to risks giving the Board, CEO and Management team visibility of issues across the organisation. Many Not for Profits grapple with what ‘Risk Management’ is. A recent survey of Australian Not For Profits found that 41% do not have a Risk Management Policy and over 50% do not have a risk register. Tickit On Demand takes the complexity out of risk management. Tickit On Demand will enable you to quickly and easily generate a risk register for your Board and store a history of risk information. Tickit On Demand is aligned with ISO 31000 (AS/NZS 4360) the new international risk management standard. If you are not sure how or where to start, Tickit comes pre-loaded with Risks, Risk mitigation tasks and Incident Reporting Forms that are typical to Not For Profits Organisations. Tickit will allow you to create your own report templates choose the fields you want, rename reports and subscribe to get them at a regular frequency. Reports such as the Overdue tasks report which provides an age analysis of overdue tasks at the click of a button would take hours to generate manually.